This project is for another cohort traveling to D*Con with me. She needed something to wear under a corset. It needed to add something to her costume but mostly cover her ta-tas and tush. Full costume shots after D*Con but the embroidery is a hint. The slip was super simple. 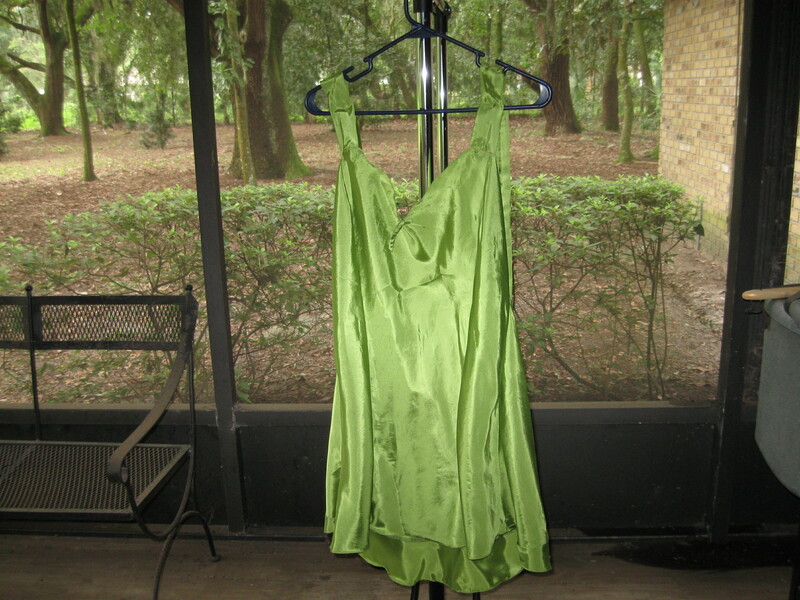 It is cut totally on the bias and drops on like a dream. I snagged it from Modern Patterns for free. You need Acrobat and make sure you include “print marks” and “labels” so that you have some help laying out pages. I do it while watching tv. My buddy Skippy is heading for DragonCon in a few days and I just finished the embroidery on one of her costumes. She wanted a more SteamPunk twist on it and we decided on a border of gears with some more on the pocket flaps. Instead of reinventing the wheel (aka gears) I bought the Urban Threads pattern. They have ‘hip’ embroidery designs. Hip? Goth? Groovy? I don’t know, but definitely not your grandma’s vest embroidery. I chose to do it in solid dark brown mostly because the multicolor sampler I ran looked meh. Skippy agreed. The next one is Square Steampunk. This was the idea that got the parasol jag started. Meg and Jamie spotted a square parasol at the local Ren Faire. Very Cute. $60. Very expensive. As the three of us often catch a bad case of “I could do that” we started making parasols. We removed the fabric and cut every-other rib down. Using a straight edge we then marked off the uncut ribs to ‘square’ up the sides. We then spray painted the skeleton with a bronze finish, only taping off the handle. You have to face the fact that it may flake or scratch off because the time it would take to prep the skeleton to seriously paint would be ridiculous. 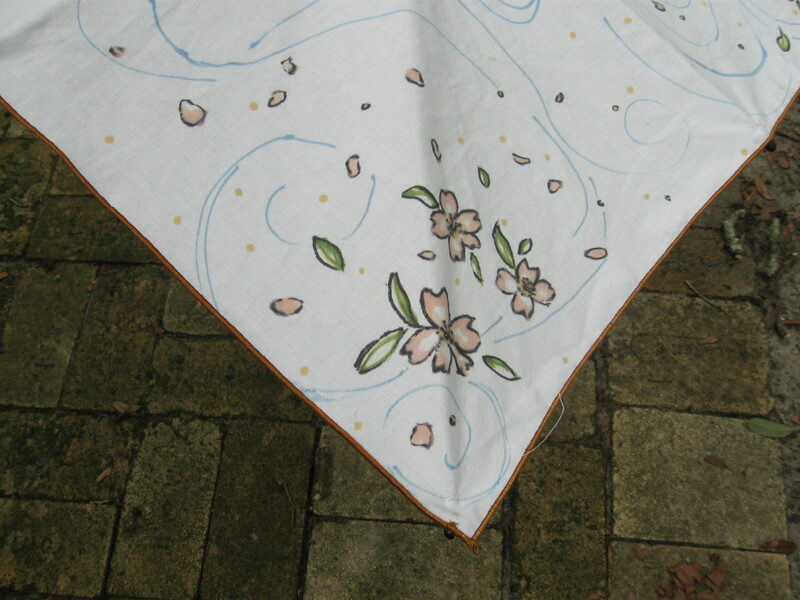 The original canopy was replaced by a square of fabric recycled from a thrift store bedsheet. The plain fabric was decorated with markers and edged with a muted gold thread on Serge (the new serger) The gold is the same stuff I use to hem Levi’s, very muted. Meg and Jamie did most of it. 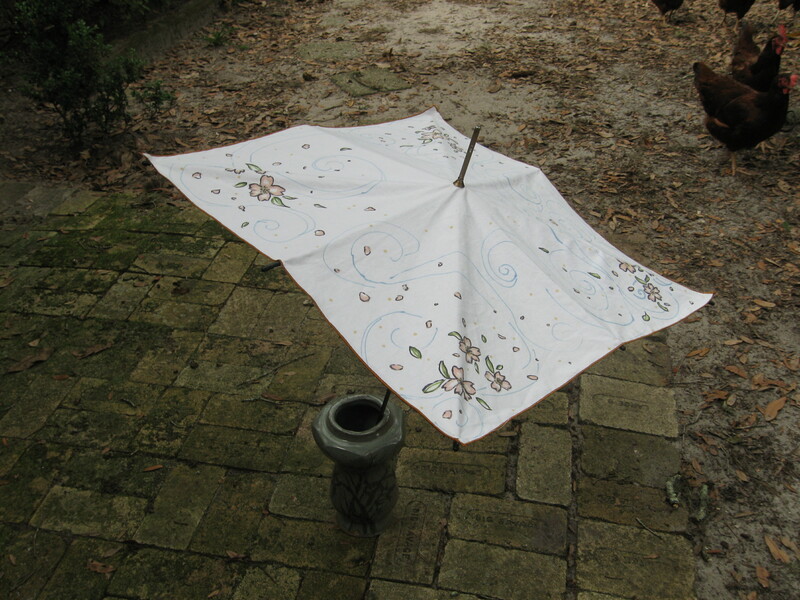 With the basics out of the way, let’s look at the finished parasols. 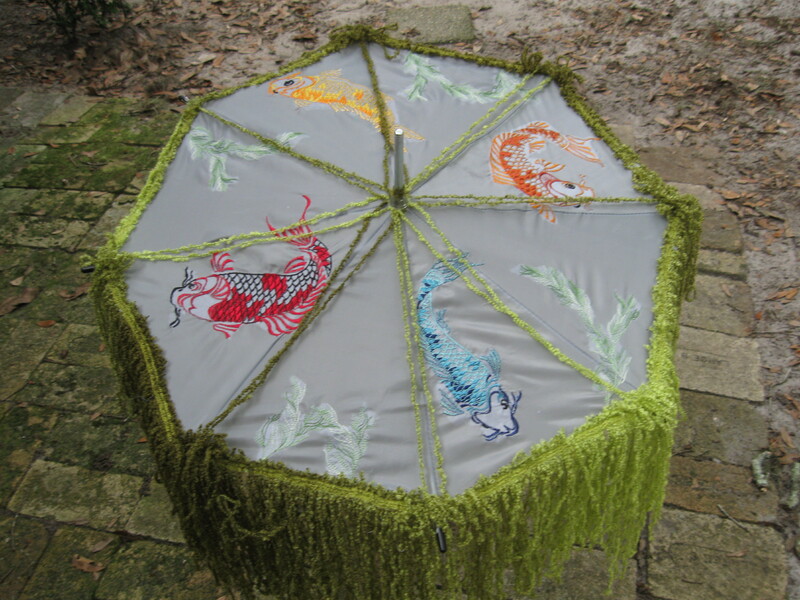 We planned three parasols for the upcoming con season. 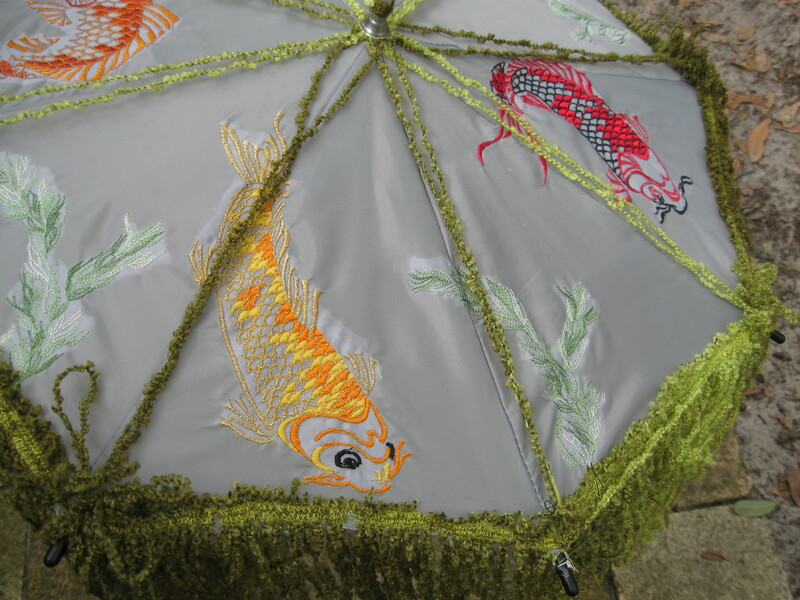 As originally planned, we embroidered koi on alternating panels and re-used the original grey canopy. 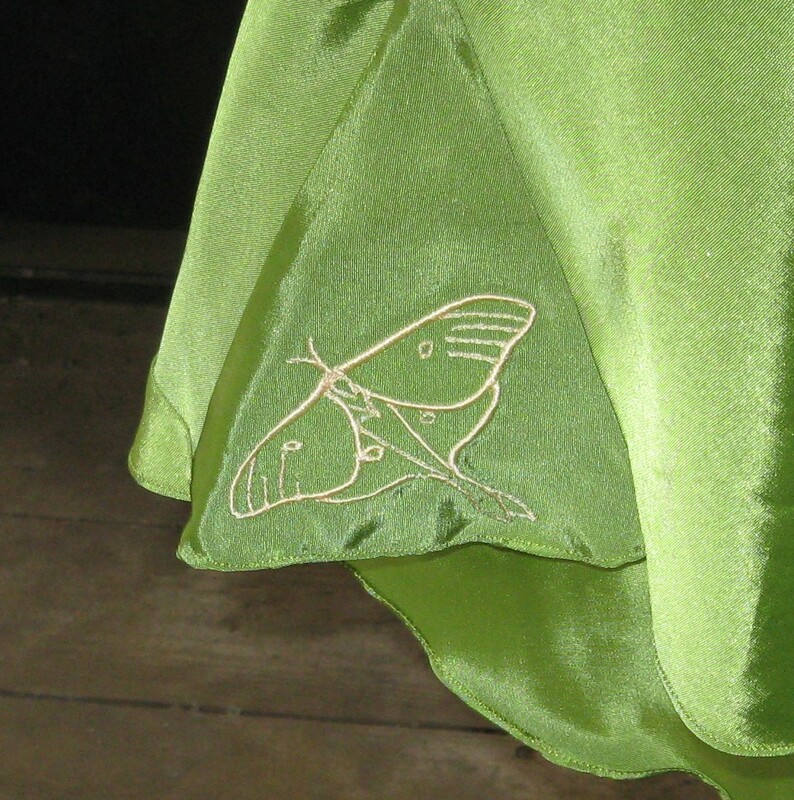 Once the embroidery was finished we had started to regret keeping the gray fabric as it ‘flattened’ the design. Not as ‘oceany’ as we had hoped. At that point we added some seaweed embroidery. Still no love. It needed something. Fringe? 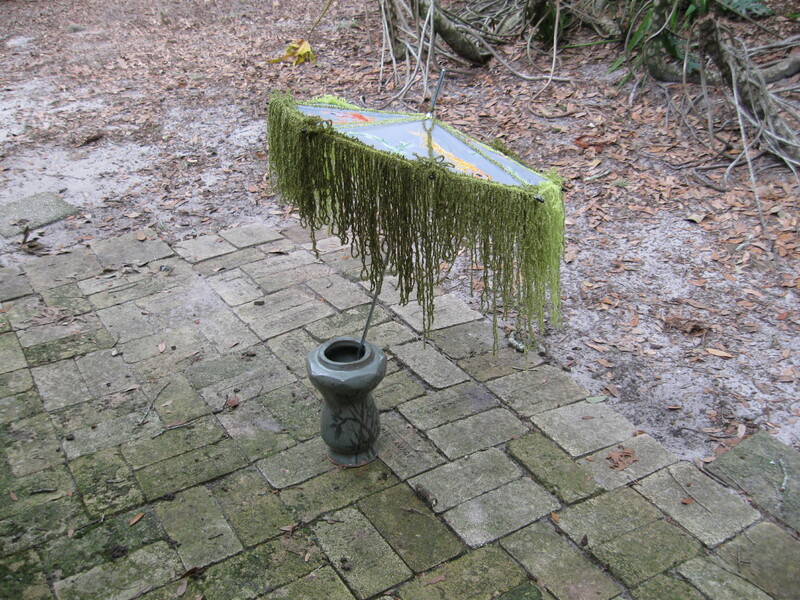 After searching in vain for a good storebought fringe and playing with a friend’s knitted shawl at a gathering of crafty women, I decide to create my own “seaweed” fringe. Using a variegated green boucle yarn and following the same pattern I kept seeing at fabric store. I zigzagged the yarn onto the edge of the parasol. Looping the yarn around to hang I zigzagged again. It was slow but totally worth the effect of seaweed edging. 1. 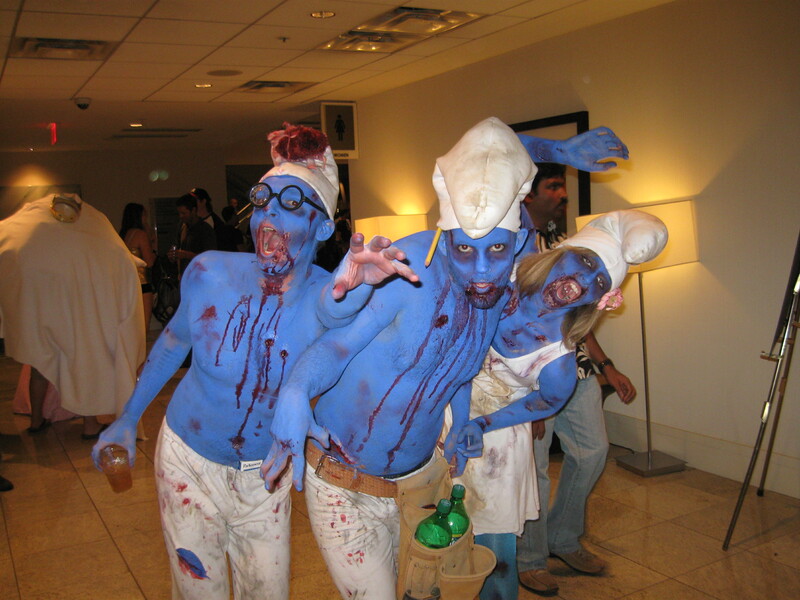 The pleasurable expectation of an upcoming convention. See also Christmas Eve as a 6 year old. 2. The cough/illness you caught after spending a weekend with 1000+ of your best buds, not sleeping, eating badly and possibly imbibing in alcohol. The first definition, that is.